Two reports published to date, in 2009 and 2011, showcase the gradual evolution of the Russian entrepreneurial experience, advancing the understanding of Ultra-High Net-Worth individuals in Russia. Both reports study a range of characteristics from the entrepreneurs’ business aims and development, to their wealth strategies and portfolios, to the involvement of their families – the next generation, and philanthropic activities. While the first report was undertaken in the middle of a global recession, the second provides comparative insights and looks at the entrepreneurs’ view to the future in the post-recession era. This 52 page research report published in 2011 revisits the issues of wealth management and succession two years on. It showcases the Russian entrepreneurial experience through the eyes of 19 respondents with a personal net worth in excess of USD 50 million, and a business or businesses with annual revenues ranging between USD 50 million and USD 1 billion. The respondents operate within diverse sectors - banking, financial services, manufacturing, mining, technology, telecommunications, pharmaceuticals, real estate and development, and retail. It presents the critical issues the entrepreneurs, their companies and their families face in managing and building their business and wealth. With a comparative view, highlighting key dynamics that have changed since the first study in 2009. Among the key findings – Russia’s leading entrepreneurs need to focus more on long-term planning and succession, in order to achieve effective generational wealth management. Campden Research reports are available on a complimentary basis to all qualifying family principals and family office executives who complete a request form. Campden Research reports are available for purchase to all other individuals. 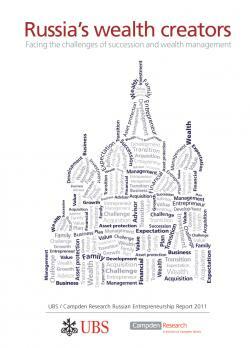 Request and purchase your copy of Russia's Wealth Creators 2011 at the bottom of this page. David Bain is editorial director of Campden Wealth. He joined Campden in July 2010 from Dow Jones, where he worked on Wealth-Bulletin and Financial News, as well as contributing to the Wall Street Journal. He has had 20 years' experience as a journalist and economist working at various organisations, including Schroders and the Economist Intelligence Unit, part of the Economist. He holds an economics degree from London School of Economics. Natasha Svetlova has over ten years of professional experience in a wide range of international legal matters, having worked at major US and UK international law firms in London. Natasha joined the family business Svetlova LLP in 2010, where her main focus is private client and business transition of the Russian domiciliaries into the UK and Europe. She works closely with individuals who sold their business interests in Russia and who seek to establish new ventures in the UK. Natasha is a graduate of BPP Law School in London and holds a Master’s degree in Applied Linguistics. She speaks English and Russian. Simon Murray started his career as an investment analyst in London. He then worked on government sponsored research study at Oxford University into the strategic role and responsibilities of boards of directors in FTSE 100 companies. Since working at Coopers & Lybrand, he has built and run successful advisory businesses in the wealth management, asset management and asset servicing sectors. He regularly writes and chairs roundtable discussions on global investment issues. UBS draws on its 150-year heritage to serve private, institutional and corporate clients worldwide, as well as retail clients in Switzerland. UBS combines wealth management, investment banking and asset management businesses with its Swiss operations to deliver superior financial solutions. Headquartered in Zurich and Basel, Switzerland, UBS has offices in more than 50 countries, including all major financial centers, and employs approximately 65,000 people. Svetlova LLP is a dynamic law firm with a distinctive approach and a 21st century vision. The firm works closely with Russian businesses and individuals doing business in the UK and throughout the world. Their client list includes entrepreneurs, business owners, real estate companies, royal families, publishers, leading photographers, artists, composers, investment funds and private individuals. Svetlova LLP have offices in London and Moscow. In the Economist, Wall Street Journal, Dow Jonoes Newswires, Fox business, Forbes, Global Finance, Vedomosti, Banki, BFM, Gazeta, Gorodfinansov, MarketWatch, Slon, UBR, World News, Dkvartal, KP, Moscow Times, Moscow 24/7, Newskey, NEWSru, Rambler-news, RBC daily, RIANOVOSTI, Russia Today, Smart Money.